Electric motor and manually operated valves feature prominently in the centralised control systems of nuclear power generating stations and make a major contribution to the economy, efficiency, reliability and safety of the station in which they operate. The emphasis on safety has raised the level of technology required for a wide range of equipment associated with these systems. IWN, IBN and ISN gearboxes have been qualified for safety related duties in nuclear power plants, and are manufactured under strict quality control conditions which ensure that the design standard qualified generically by type test is maintained during manufacture, and the specific requirements of the application are met. Rotork Gears nuclear specification gearboxes have been environmentally qualified in accordance with IEEE-Std-382. The basis of this qualification is a series of comprehensive tests conducted by Wyle Laboratories, Nuclear Logistics Inc, Trentec Inc USA and Kinectrics, Canada. Please see PUB027-003 for further information and qualification test parameters. 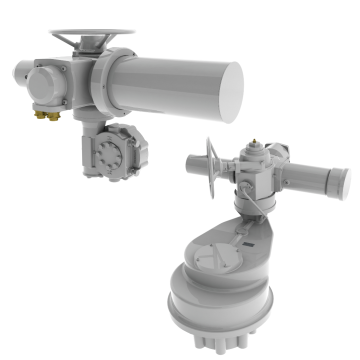 Rotork also provides electric valve actuators for the nuclear power industry.